Hi Everyone just joined the forum so I am after some advice which I am certain to find here after browsing the various posts. I have an i3 so uncertain if there are many members on here who have one- yes I can hear you all now ''not one of those things ' 'you need a real BMW lad' anyway I'll cut to the chase. 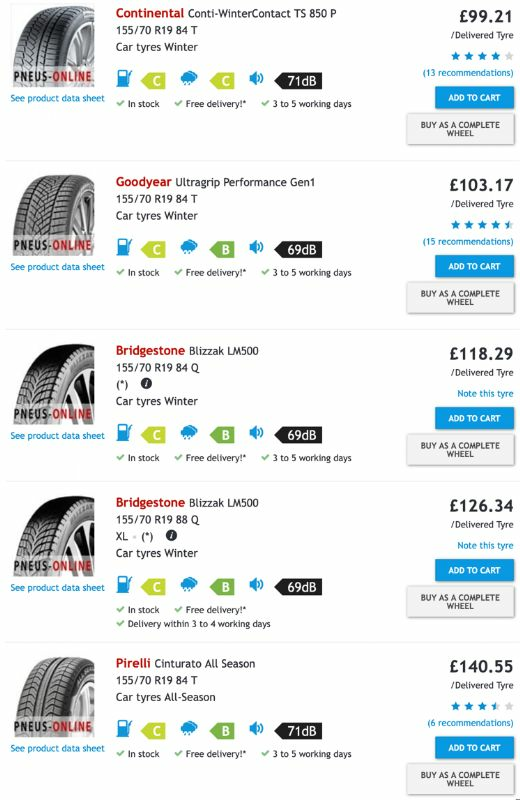 I have found that there appears to be very little choice in tyres for this car which I find a bit annoying, on searching the internet I am unable to find more than one supplier for the rear rims which are 175/60R19.This being the Bridgestone EcopiaEP 500 tyre- and that's it ! its a summer tyre and I can not find any other firm that makes a tyre of that size. The rear rims are 5J but I now have found a all season tyre that is 19inch but is a 205 and that is the KleberQuadraxer 2 205/55 R19 97v XL so my question is can you put a 205 on a 5J rim ?? when the original tyre was a 175. I checked on The Tyre Bible site for the profile size due to the width being wider and it would be plus 1.5 mph at 70 mph. There appears to plenty of space around the wheel under the rear arch for a tyre of this size I understand that at the front you can ONLY fit a 155 tyre on the rims due to the space and lock on the steering. So what happens if you need a new tyre due to a mishap and recovered by the brake down service?? on a journey as this car has no spare wheel like many other cars BUT at least with any other car you are more than not likley to find a tyre at any tyre outlet to fit your car rims. Hello not too sure how old the vehicle is? However, if you have BMW warranty that includes breakdown and recovery cover. They will then recover you the the nearest BMW dealer, if the dealer is not open they will recover the vehicle to the dealer and you may be entitled to accommodation* check your policy. If the dealer cannot fix your vehicle, you may be entitled to a loan vehicle until it is fixed again check your policy. Personally I would buy another wheel and tyre if you are that worried and keep it at home, then get recovered to home and change the wheel? Will take on board the spare wheel idea and thanks again for the tyre info. When I have time i will pop in to a tyre shop and ask about the 205 tyre replacing the 175 on a 5 J rim maybe a wider tyre on the rear will stop the alarming rate of wear on the 175 tyres, I have looked at new 175 summer tyres for the rear and the the tread depth does appear to be not that deep but at the end of the day when there is no choice for the 175 size you just have to buy them! If i went over to 155 tyres for winter I will need to buy 2 rims for the 155 tyres for the back as they are to wide for these tyres, really don't understand why a car like the i3 needs wider tyres on the back than the front its not a big beast of a car like some members on this forum must own !! just make them all the same width and make a choice of winter ,summer ,all season tyres available for the owner!! Thanks again will sign off by saying what is a Norman Burnam Alpina E65 B7 E39 523i Saloon sounds way beyond my understanding !!!! must be awsummly good! ALPINA B7 - this is the Chris Bangle designed E65 model 7 series car and the engineering, suspension and interior is ALPINA design. Built in December 2005 and registered in Jan 2006. It is a 4.4 V8 Supercharged engine containing 1200 hand build parts. The Bhp 520 and 700Nm of torque, top speed nearly 190 mph. There were 11 right hand drive models made for the UK between 2003-2008, 7 remain. None of the 7 are the same and mine has individual platinum merino leather with black piano wood trim and Alcantara headlining. The original cost price was 93, 750 pounds. The E39 car cost me around 500 pounds used, it is one of the most solid BMW Cars ever made in my view. It is a 5 series Saloon with a 2.5 litre petrol engine the car is 20 years old this year and has done over 175,000 miles. These cars could be classed as marmite too, one is fairly rare and expensive to maintain the other is old, not pretty, reliable and does not have those features one might expect in say an i3. There simply is not right or wrong, each individual must choose their preferred car(s) and if they are happy it is not for others to say it is wrong, they can of course say they prefer something else. This might help, I have a JV business for storage with a Company called Tanvic Tyres. They sell around 80 million pounds worth of tyres in the UK annually. They do have a specialist tyre division. email jo.terry@weselltyres.com say I gave you her mail, see if she might help.